Steven Romick’s FPA Crescent Fund commentary for the second quarter ended June 30, 2018. The second-longest bull market in the United States in the last century began its tenth year in the second quarter. Without a market correction, a new record in bull market length will be set this quarter. The FPA Crescent Fund (“the Fund”) returned 0.32% in the second quarter and declined -0.66% in the first half (1H) of 2018. In comparison, the S&P 500 produced a 3.43% return in the second quarter, while the MSCI ACWI generated a 0.53% return. Those indices have returned 2.65% and -0.43%, respectively, year-to-date during the first half of 2018. Growth continued to outperform value year-to-date, hurting the Fund’s performance relative to the broader benchmarks. The Russell 1000 Growth Index returned 7.25%, while the Russell 1000 Value Index declined -1.69% in 1H. One needn’t look much further than the investments that had the greatest impact on the Fund’s Q2 performance to drive this point home. Three of its top five contributors are considered “growth” companies -- Alphabet (Google’s holding company), Facebook and Microsoft. Crescent has held Alphabet and Microsoft for much of this decade, while Facebook is a more recent position. The holdings that hurt Q2’s performance largely fall in the “value” category. The companies we own have mostly met our expectations, with some exceeding and a few disappointing. That’s always been the case, though. Unfortunately for the Fund’s recent performance, we have only owned some of the highest profile growth companies, Facebook, Apple, Amazon, Netflix, Google – or the FAANG stocks. Amazon (+45%), Apple (+10%), and Netflix (+106%) contributed 66% of the S&P 500’s gains in 1H 2018. Amazon’s future business model is more understandable to us than either Apple’s or Netflix’s, and we’ve written in the past that we wish we had purchased Amazon earlier this decade. But that doesn’t mean we would like to own it now, given its lofty valuation. One doesn’t remedy a miss in the strike zone by reaching for a ball high and outside on the next pitch. In good conscience, we can only own a business whose future we believe will unfold favorably. For example, our inability to discern what Netflix will look like in ten years curbs our enthusiasm. There’s no arguing its tremendous success in almost single-handedly getting the cable video subscriber to cut the cord. Yet, its unprecedented program spending for both current and future commitments, as well as new competitors like Disney, which will shortly “repatriate” its content for its own, over-the-top platform, make the future performance of Netflix unknowable to us. Perhaps that limitation is ours alone, but a limitation it nonetheless is. Our strategy is largely to purchase equity in undervalued businesses and high-yield and distressed corporate debt. If we have correctly assessed the opportunity, we believe our investments can deliver a better than market rate of return by virtue of a discounted valuation. The market will define some of these investments as value and others as growth. We describe them as opportunities to allocate capital to idiosyncratic investments that hopefully will allow us to deliver on our oft-repeated goal of producing an equity rate of return while avoiding a permanent impairment of capital. Fund investors like to label their managers -- you’re growth, you’re value. You invest solely in the U.S., only offshore, or maybe all over the world. You buy stocks, or you buy bonds. Although we can’t invest in everything, we have a charter broad enough to invest in most publicly traded stocks and bonds. Our broad flexibility and conservative mandate means we have never been easy to label, but we always have been (and always will be) value investors. In our mind, all sensible fundamental investing is value investing, by which we mean buying a business or asset for less than what we believe it is worth under a number of reasonable scenarios. Buying growing businesses with an adequate margin of safety is just as much a value investment as buying, say, a financial firm at a discount to tangible book value or a holding company at a discount to readily ascertainable net asset value. We’ve held all three types of investments in our portfolio over the past decade. When analyzing businesses, we focus on the key performance indicators that we believe matter. Sometimes financial statements tell the story, and in those cases, investments typically appear “cheap” based on reported financial results. In other situations, information not in the financial statements might be most relevant, for instance, data like a company’s position on the cost curve, its subscribers/user base, its total addressable market, its customer acquisition cost, the lifetime value of a customer, or real asset marked-to-market. In these situations, our holding might appear “expensive” based on reported financial results, but not when one looks at these other factors. Our value approach is the same no matter what the ultimate driver of intrinsic value. We suspect that balance sheet sources of value will prove a less fertile source of opportunities than in the past, given evolutionary changes in the economy and business models over the past 30 years. In the past few years, the team has spent much time building a base of knowledge in businesses that are capital light, demonstrate outstanding economics and are likely to offer substantial organic growth over the next decade. Some of these companies are too hard for us to underwrite and others trade at values that seem devoid of a margin of safety, but others, like Facebook, Expedia, JD.com and Baidu, have made it into our portfolio. Admittedly, no bright line divides growth and value. Lacking a more robust methodology, index funds place some companies into both buckets. A company with a low price-to-earnings ratio but a high price-to-book may find some portion of its market capitalization allocated to a value index and the remainder in a growth index. With active and passive funds building ever larger exposure to growth stocks, the lack of oxygen left in the room for value stocks has triggered some wilting in price. That, along with somewhat higher volatility, has allowed us to initiate new positions. 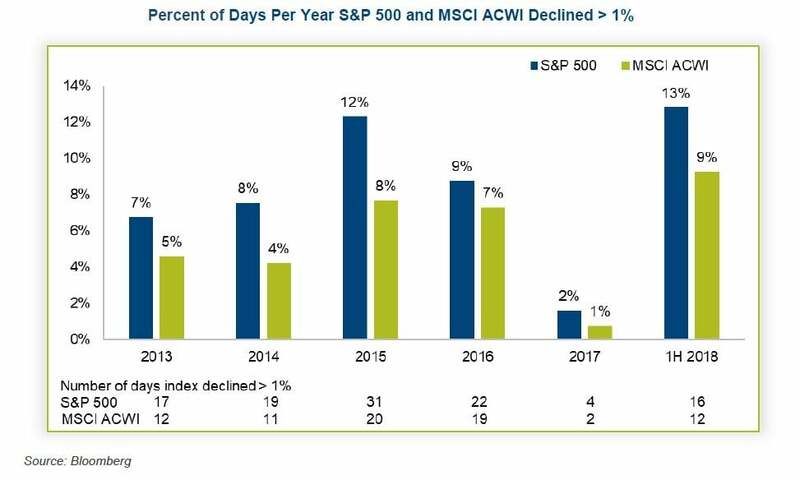 Last year the U.S. market posted the lowest volatility on record, but 2018 has seen bigger ups and downs.3 The S&P 500 has already declined more than 1% on four times as many trading days in 2018 than in all of last year; the MSCI ACWI, six times as many. When investors become fearful, we like to take advantage of indiscriminate selling. In 1H, that allowed us to establish eleven new long positions and exit seven. This is more portfolio movement than we’ve had in years. 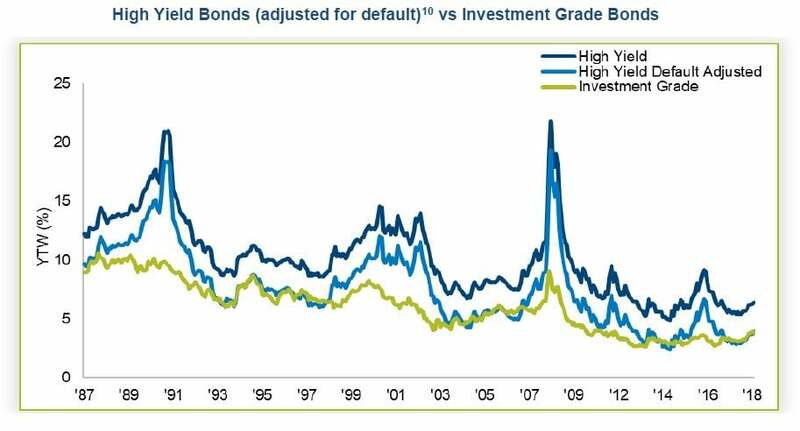 The market hasn’t presented a similar opportunity in corporate bonds. Low yields and a lack of appropriate discounting of risk have kept us away. At purchase, the corporate debt in our portfolio should offer a yield well in excess of a risk-free rate like an equivalent maturity US Treasury note. The greater our expectations of interest and principal at maturity, the lower the yield we are willing to accept, yet our minimum threshold is still generally 10%. When we think a bond has a strong possibility of restructuring, we insist on a higher yield-to-maturity at purchase, usually in the mid-teens. None of those conditions exists today, which explains our negligible exposure to high-yield bonds. During Q2, we added to our holding in Arconic, an aerospace and value-added manufacturer that was spun out of Alcoa in late 2016. While Arconic was widely considered a “good” business within Alcoa, it was poorly managed and spent the early part of its life after spinoff waging a wasteful proxy contest to protect a failed CEO and defective board. After a begrudging surrender to shareholder demands, Arconic spent 2017 with a caretaker CEO at the helm. The reconfigured board selected a new CEO who joined in January 2018, and we believe he’s quite capable. Arconic underperforms its peers from a margin perspective by anywhere from 300 to 1000 basis points, not particularly surprising given its history of poor management and governance. In Q2, reduced guidance for 2018, combined with trade concerns caused by the Trump tariffs, meant Arconic put the biggest dent in the Fund. But the stock’s decline gave us an opportunity to increase our position at a price that we believe discounts the possibility of the company improving its operating performance. We believe the company’s competitive position and market opportunity remain intact. While operational improvement will certainly take time, the combination of leading market positions and a capable management team leave us optimistic that Arconic will ultimately achieve its operating potential. We also increased our position in AIG during the recent quarter at prices that represent 0.8 times tangible book value and roughly 11 times estimated 2018 earnings. We believe the shares represent good value based on current operations and are hopeful that new management will meaningfully improve the company’s return on equity. For more detailed AIG thoughts, please see our AIG Investor Day slides4. Corporate tax cuts for U.S. companies have been a big driver of recent U.S. market returns. Lower tax rates translate into higher earnings for companies with large profits in the U.S. Thanks to tax cuts, Wall Street estimates have been raised in 2018 for tax cut beneficiaries, but when it comes to projecting earnings, Wall Street analysts are usually overly optimistic. From 2010 to 2017, consensus earnings per share estimates were typically cut by 9%. There is an expectation by many that the earnings benefits from a tax cut will not be competed away. In our view, that won’t be universally true, though. Many companies manage to a return on capital (ROC). If ROC gets too high, competition comes in the form of lower prices, reinvestment in marketing, new competitors, etc. The tax cut’s benefits will not all flow to the bottom line in every case. It’s no surprise that risk assets don’t provide the highest margin of safety in the context of the almost decade-old bull market and economic expansion. In our recent bi-annual FPA Investor Day, we provided commentary and slides that speak to the state of the markets. Rather than repeat it all here, we refer you to our prepared remarks5 for this bigger picture perspective. In this letter, I’ll just focus on one valuation measure – earnings yield, or the inverse of the price-to-earnings ratio. Like a bond, the higher the earnings yield, the cheaper the security, while a lower yield means it’s more expensive. Equities, unlike bonds, don’t have a maturity; bankruptcy is a notable exception. Stocks have infinite duration. In a vacuum, a longer duration means additional risk, but owning a stock has the added potential of an increasing coupon via higher earnings. An expected yield can be calculated for corporate bonds and for stocks. The higher the expected yield, or internal rate of return, and the wider the spread to the risk-free rate, the greater the margin of safety, all else being equal. That margin of safety can expand the better the business gets and the greater the confidence in our determination of the likely outcome. 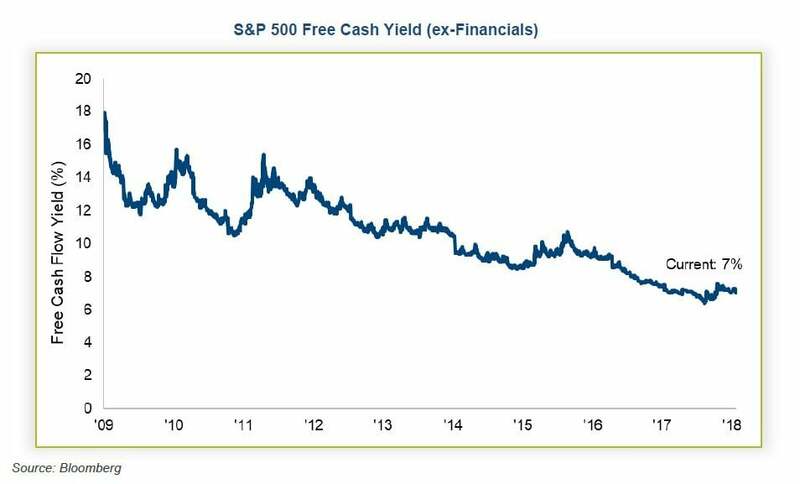 As stock prices have risen after the Great Recession, the S&P 500’s free cash yield has reached cyclical lows (excluding financial stocks, whose free cash yield is calculated differently). This meager, mid-single-digit yield was last this low in 2008, the prior market peak. Since then, stock prices have risen along with U.S. Treasury yields (a proxy for a risk-free rate) compressing the equity risk premium. The current 417 basis point spread is less than half the average since 2009 and well below its peak, which makes a case for the cautious allocation of capital. This doesn’t mean there is nothing to do, just less than we would hope. Markets go up and down based on good and bad news, generally peaking when the news is most optimistic and finding their nadirs when the previous buyers seek safer havens and become sellers. Right now, the economy remains healthy; interest rates sit not far off their lows; inflation in most economies is benign; the world is mostly at peace, and markets have continued to grind upward – a daily validation that the future is bright if only because the recent past has been so. The blue line on this chart below shows the trailing 10-year return of the S&P 500. 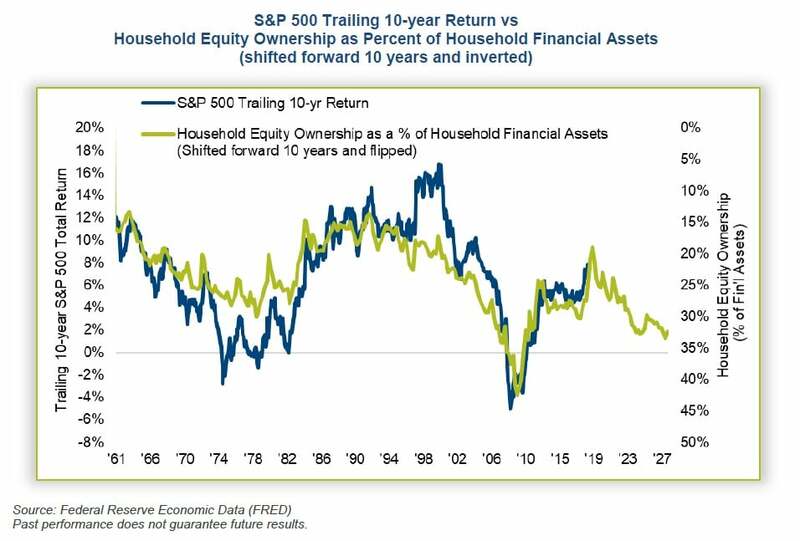 The green line shows household equity as a percent of household financial assets, shifted forward ten years and flipped upside-down to more clearly depict its correlation to the S&P’s return. You can see the green line reaching its nadir in 2010. That was really the peak – remember, the chart is flipped. Since it’s also shifted forward ten years, that peak of about 40% really occurred 10 years earlier in 2000. In other words, household investment in stocks hit a high in 2000 and suggested that returns would be negative single digits and that’s what happened. The inverse relationship between household ownership of financial assets and future market returns has clearly been present for 56 years. Optimism hasn’t been this high since 2000. Stocks last took a serious whopping a decade ago. The S&P 500 has just delivered 15 consecutive months of positive performance, and many investors hold the view that it’s hard to lose money. What can go wrong? Surely nothing, given that elected officials are operating with not nearly enough knowledge or discipline, and possibly self-interest. At least we have the “steady” hands of central bankers around the globe, the same ones who have been the biggest buyers of Japanese stocks (BOJ), the largest buyers of U.S. Treasuries (U.S. Federal Reserve), the largest buyers of European corporate bonds (ECB). Meanwhile, the U.S. President is losing the faith of longtime U.S. allies, igniting trade wars and pursuing ill-conceived and constantly shifting policies. There is a view that stocks are much cheaper outside the U.S., but that’s a view from 30,000 feet that doesn’t hold up once you drill down and compare a U.S. company to a reasonable, albeit imprecise, analog abroad. Like-for-like-ish companies are priced similarly around the world, as we concluded when looking at the admittedly small sample size in the following table. Proctor & Gamble trades at a 14% discount to Unilever but at a substantial trailing twelve month price-to-earnings of 19.2 times, vs Unilever’s 21.9 times. Unilever did grow earnings at a faster clip over the last decade, but just 2.7% faster compared to P&G’s 1.9% – both rather meh, and if the future were to be in kind, poor justification for their valuations. SAP’s trailing twelve-month price-to-earnings, at 28.1 times is 70% higher than Oracle’s, which is hardly validated by SAP’s earnings growth in the past decade of just 6.8%. Oracle, with its far lower price-to-earnings ratio of 16.5 times had only slightly lower earnings growth of 5.9% over the past ten years. Stocks are no bargain anywhere, but complacency seems to be most everywhere – a potentially combustible combination. In the last 60 years, the S&P 500 has only been more expensive once, during the late 1990s tech bubble. We will eventually have a recession and may end up with inflation, or perhaps even deflation. Our portfolio is set up to play the middle. Our stocks and the equity markets in general will likely perform poorly in a deflationary environment, but our cash position will likely outperform equities in such an environment and provide a source of funds for investment in what could be a period of distress. If we end up with inflation, well then, our cash will likely lag but our stocks should deliver some nominal benefit. As we have said, we manage this portfolio as if you have given us all your money (although we do not suggest that is the prudent course). But if one manages your capital as if one has it all and there’s no safety net, it tends to breed prudence. Of course, there are more hardy individuals who prefer life on the high wire. Speaking of circus acts, investing in the high-yield market right now feels a bit like sticking one’s head in the lion’s mouth. High-yield bonds offer a gross return of just 6.4% in the U.S. and 4% in Europe. Even such unattractive returns could only be realized if no corporate bond defaulted. But inevitably, some portion of that universe will default, delivering a lower “net” return. 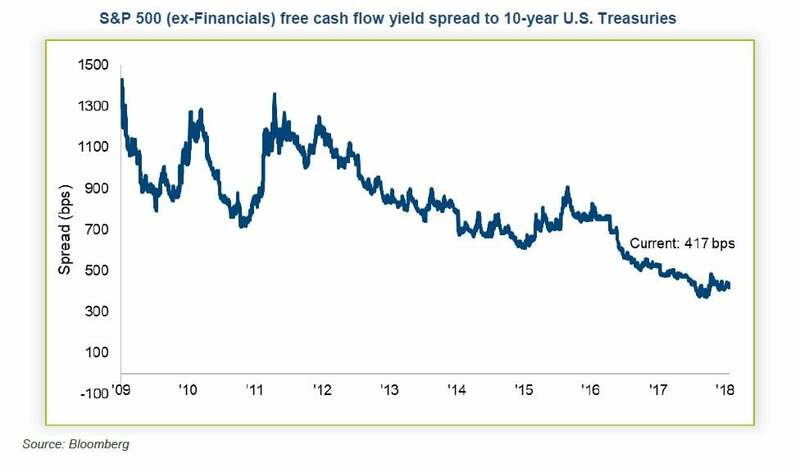 In the following chart, you can see that not only is the net yield low, it’s no better than yields on investment grade bonds, begging the question, “Why bother?” At this point, we won’t. 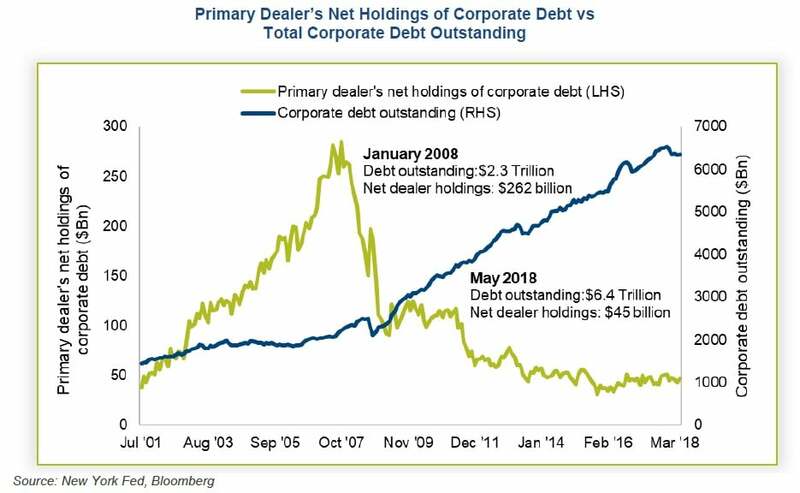 …in a high yield/levered loan market that is roughly twice as large as it was a decade ago and total corporate bonds are 2.8 times larger, even as the relative support from corporate bond desks is down by more than 90% (as a percentage of total corporate debt outstanding)! We surmise that when there is a correction, prices could get blown out. Dare we hope. There is, of course, a price for conservatism: underperformance for a period, generally followed by a shrinking business. We are fearful of neither. One should demand an alignment of interest between shareholder and portfolio manager, and we believe we successfully deliver that. That might be harder for a passive fund, like an index or ETF, which should invite the shareholder with a long-term buy-and-hold philosophy and the internal gumption to not head for the hills when markets turn sour — a test rarely passed amid market declines. We believe an active value manager will likely fare better in a declining market -- and hopefully scare fewer clients away and out of the market. A globally diversified value manager who invests in stocks and higher yielding corporate bonds and exhibits a willingness to hold cash should attract the independent investor less concerned about performing in line with any one index, particularly over shorter periods (and even be accepting of underperformance in the short term so long as there’s an acceptable reward eventually for such loyalty and patience). The Crowd is rarely right, and this time is unlikely to prove the exception. When stocks do decline, they tend to fall more quickly than they rise. The good times that investors think will never end morph into bad times that investors think will never end.